Emerging stayer Cincinnati has big things on the horizon according to jockey James Winks. Winks partnered the Sebring gelding to a strong three-length victory in the Mitchelton Wines BM64 Handicap at Seymour on Thursday. "His performance today was impressive. He has improved a hell of a lot from when I rode him as a younger horse. It's a credit to Danny for giving the horse the time to mature," ," Winks said following the emphatic victory. 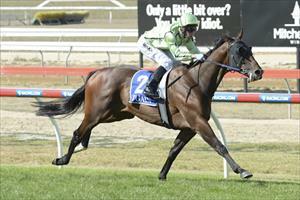 "The owners have some exciting times ahead with him as he is a really progressive stayer. I know his opposition wasn't the best today, but he can't do any more than the way he put them away. He was smoking throughout the race and although we were in an awkward spot, it was a matter of counting to 10 and getting him clear."